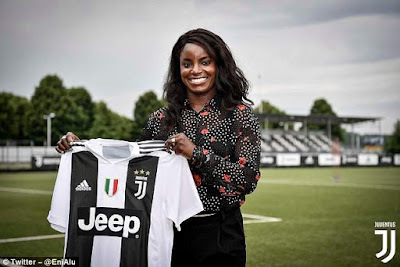 The Nigerian and English footballer, Eni Aluko has joined the Italian champion Juventus Women of Chelsea. England's 31-year-old international, who has scored 33 goals in 102 appearances in England, in addition to helping Chelsea win their recent league and cup double, was announced today in Italy. 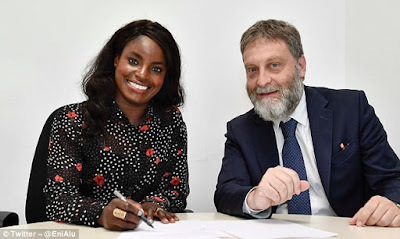 "Juventus Women is pleased to announce the signing of England international striker Eniola Aluko," Juventus announced on its website. Welcome to Bianconere, Eniola! Aluko, who has already played for Birmingham and Charlton, as well as other clubs in the United States, will join English player Katie Zelem on the team. In August 2017, Eniola, who is the older sister of Nigeria striker Sone Aluko, accused former England coach Mark Sampson of making racially discriminatory comments in 2014. At that time she claimed that Sampson made a racist raid on Ebola and her family in Nigeria. In the following month, Sampson was fired for "inappropriate and unacceptable" behavior with players in a previous role, with former Manchester United and Everton defender Phil Neville taking over in January.